Fifty years have passed since he was deliberately struck down by the murderous bullets of the Zionists appointed for this assassination. His fight against Zionism was so determined because his devotion to Torah Judaism was so deep and although he was repeatedly warned of the danger, selflessly and fearlessly he went forth to do battle with the prime adversary envisaged as the salvation of the whole Jewish People; a consoling dream yearned for; a hope awaited. Professor De-Haan understood Zionism for what it really is. He sensed it, he recognized it and made hiss life a mission to combat it. It is this life of Professor De-Haan which true Religious Jews will never forget; his tragic death they will always remember. He was, perhaps, not rightly appreciated in his lifetime. He had opposition from his own circles. The Aguda, under whose banner he fought and whose creation was primarily to combat Zionism, was already showing the seeds which are now so apparent. The tendency to go along with the stream had started-if not yet in full swing as now, at least not too far behind. The "Israelite" of Frankfurt, the cradle of that deep misconception of a fusion of Torah and Western culture, could not appreciate nor even understand the straightforward Messiras-Nefesh of De-Haan whose soul alone defied and overpowered the narrow avenues of worldly thought with which this Professor of International law was so well acquainted but which he had transcended and left behind completely. The Zionists, however, did appreciate that great man to the full. They saw in him their implacable opponent: in his devotion to true Judaism-a challenge: in his outstanding ability-a supreme danger: in his determination their cue for action. They concluded that only their murderous bullets would rid them of that problem and they had recourse to them. cowardly and in cold blood. Professor De-Haan should be remembered the more at this juncture when the all-embracing Zionist Tummoh has become so established, so popular and so universally acclaimed. When all hands are dropped, when all strength is exhausted, when all truth is gone, when klall Yisroel is ruled by stupidity and lies, Professor De Haan's memory should be given more and more prominence. His body, pouring blood, carried in the darkness of night should be pictured on every wail. The last feeble beats of his pure heart should forever sound with the rhythm of re-awakening and revival. Many thanks to Mr. E. Marmorstein who was willing, and indeed found it his duty, to write down in this narrative the facts about the life and death of Professor De-Haan in a moving and descriptive manner. 8y now, when Zionism is moving slowly but surely in the realm of the past it is even more important that the facts about this episode in Jewish history should be known. Professor De-Haan was a message. His martyr's death demands constant awareness. It is a ceaseless voice piercing the heavy silence into which we are sunken. His grave echoes a call to the living not to forget that we are Jews whose Jewishness has set out to eliminate and to destroy. The tragic end of Professor De-Haan Z”L is a lasting memorial of the opposition to Zionism, to its achievements, to its State and to all that goes with it. Many have died, unfortunately, for the cause of the Zionist idol. He is one who gave his life to defy it. There were others who gave much in the fight against this all pervading Tummoh. He gave his all. And when the Zionist achievements will be gone and forgotten, when his murderers will have vanished from the face of the earth, the name of Reb Yaaakov Yisroal Ben Yitzchok Isaac De-Hann will stand out supreme-a shining star. His is the place of honour forever, amongst the great of our People. According to Tudus of Rome (T.B. Pesachim 53b) the plague of frogs inspired Hananiah Mishael and Azariah to court death in the fiery furnace (Daniel 3): since, they reasoned, the frogs, who were not commanded to lay down their lives for the sanctity of the Divine Name, entered the ovens of Egypt, we who have been so commanded must surely emulate them. This argument was questioned by Rabbi Jonathan Eybeschutz on the grounds that the frogs were also obeying orders-"and they shall go up and come into your house and into your bedroom and upon your bed and into the house of your servants and upon your people and into your ovens and your kneading- (Exodus 8,3). In reply to his own question, he suggested that the frogs were not divided into separate detachments, each with its specific objective: all were therefore free to prefer the luxury of Pharaoh's bedroom, where they could croak in his ears all night in comfort, to the heat of the ovens; and only from those who chose the most dangerous way of obeying the Divine Will did Hananiah, Mishael and Azariah derive their a minori ad majus conclusion. On the analogy of the frogs, we who would rather discuss and describe the Wars of the Lord than participate in them -I mean of course, myself- are constantly challenged and rebuked by the heroism of Jacob Israel De-Haan. Granted, however. that a sense of guilt partly underlines my initiative in arranging a modest celebration of the fiftieth anniversary of his death, it hardly accounts for the fascination he has held for me since the morning not long past my fifteenth birth day-when the words "De-Haan ist ermordet" greeted my father on our arrival at prayer, I was soon to hear more of him in Galanta, where I spent part of the summer holidays under the instruction of Reb Leib Deutsch , the son of my father's former teacher, Reb Mandel Deutsch' who then lived in Jerusalem-he was the (second) father-in-law of Rabbi J. H. Sonnenfeld. I was told, in considerable detail, how Reb Mandel had defied the direst threats to deliver a eulogy at the graveside, as well as something of the character and nature of the man for whose sake menaces were ignored. But it was not until my own arrival in the Holy City (1934) that I could form a more distinct impression of him. Long conversations with people whose recollections of him were still quite vivid-Muslims and Christians as well as Jews-revealed "a small, plump, blond-bearded man in his early forties", a congenial companion as well as a talented poet and witty feuilletonist, whose passion for truth endeared him to his friends and raised a host of enemies. Furthermore, I gained a superficial knowledge of his background and professional career. He was born in Smilde (Holland) in 1881 and spent his childhood in Zaandam, where his father was employed as cantor and teacher by the local community. His early development roughly resembles that of many of his Western and Central European contemporaries, clever boys born into conventional Judaism and estranged from it shortly after leaving the parental home in the pursuit of wider opportunities of advancement. While training for the teaching profession, he began to attract attention in literary circles. Among the admirers of his poetry was a (non-Jewish) physician, Johanna van Marseveen, whom he subsequently married. She subsidized his legal studies, which led to his appointment as a university lecturer. He joined the Social Democrats: his membership of a party delegation to Russia resulted in a book on the condition of political prisoners in Tsarist jails; and in February 1918 he attended the conference in Amsterdam at which the forthcoming peace negotiations came under review. Soon afterwards he renounced Socialism. The publication of Het Joodsche Lied (the Jewish song) had marked the start of his return to a Judaism more fervent than that of his childhood environment. He was now attached to a group of religious Zionists associated with the Mizrachi, which, towards the end of 1919, feted him as the first Dutch Jew to settle in Palestine under Zionist auspices. There he earned his living as correspondent of the Amsterdam Algemeen Hdndelsblad and (from 1923) the London Daily Express. He also lectured at the Government Law College in Jerusalem. Throughout his first year, his popularity as a speaker proved an asset to the Mizrachi, which had recently established branches. Nevertheless, in the latter half of 1921, he was writing to the effect that adherence to it was justified anywhere in the world except Palestine or, in other words, that the party's approach to Judaism, dominated as it was and is so largely by feelings of ethnic solidarity, could be no more than a prelude to the personal experience of the Divine that meticulous observance of the commandments in the Holy Land can offer. The breach with the ideals of the Zionist movement was drawing nearer, and it was aggravated by his satirical comments on its leadership's political judgements and tactics-he shared the Western intellectual's contempt for less sophisticated varieties of the secular pattern of thought. To describe him as coming under Rabbi Sonnenfeld's influence would be a dilution of the rare quality of a disciple's humble submission to his master. In total surrender to the overriding claims of the Holy Torah, pride was stripped from him as, under the master's guidance, he became increasingly sensitive to the enormity of guilt and the boundless compassion inherent in the Divinely granted power of reconciliation through contrition. "Let the wicked forsake his way and the man of iniquity his thoughts" (Isaiah 55, 7). The moralists, to whose writings he was now directed, laid special emphasis on repentance from sinful thoughts on the grounds that they were sooner forgotten and neglected than sinful actions. One of their remedies was to record sins of thought as well as deed on paper and inspect the list regularly in order to atone for the past and resist in future. De-Haan became an exponent of creative confession. In addition to prolonged prayer and rigorous fasting, he refined his conscience by illustrating the war of the impulses and the contest between faith and unbelief, in fact, the struggle for his own soul, in moving quatrains. He could certainly have said, with the Psalmist (.51, 3), "my sin is ever before me". His penance was completed by his public life in the few years left to him, when he might well have echoed the Psalmist in another context: "I have become a stranger to my brethren and an alien to my mother's children, for zeal for Thy house has consumed me and the reproaches of those who reproach Thee have fallen on me" (69, 8 and 9). He was in need not only of "delivery out of the mire lest I sink' but also of protection "from those that hate me" (69, 14). Rabbi Sonnenfeld, for his part, had reason to regard De-Haan's allegiance as providential. The community, which he had been practically coerced into leading, was formed under a regime headed by a Zionist High Commissioner and pledged to implement the Balfour Declaration. Whatever else that document may or may not have implied, it certainly recognized Jews as a national entity rather than, as in Ottoman times, a religious body; and it thereby paved the way for the conquest of the communities, which would seem to have been the primary aim of the Zionists in the early years of the Mandate. They did, in fact, achieve it to a very considerable extent: with government encouragement, deriving not only from their constitutional position under the mandatory regime but also from the general tendency of British colonial policy to prefer indirect to direct rule, they created ostensibly representative institutions in preparation for a single Jewish community under their control. More surprising, in view of the fall in numbers and resources as a result of war-time privation, was the extent of opposition on the part of the pre-war inhabitants. In a letter dated 22nd February, 1922, Artur Ruppin, who had been sent to direct Zionist activity in the country in 1907, noted that a Zionist newspaper's campaign against their schemes was attracting support "particularly among the Orthodox and the Sephardim, who were Zionism's open opponents in the past and are now its concealed opponents. Owing to the opposition of the Orthodox and the Sephardim, the Elected Assembly has had to he adjourned, and it is in the nature of things that this has immediately brought about a recognizable decline of its authority. I fear that thus the organization of the Jewish population of Palestine, which was proceeding well, has again been impeded. The hope that the Jewish population-as an organized community-would be empowered to levy taxes has also been disappointed once more: were it fulfilled, the foundation stone would be laid for the Jewish population's independence of aid from abroad in respect of the financing of its communal institutions" (Pirqe Hayyay, Tel Aviv 1968, III p.32). Subsequently, many of the Orthodox and most of the Sephardim, who then together constituted a majority, succumbed to the familiar mixture of inducement and intimidation, leaving Rabbi Sonnenfeld and his following almost isolated. Indeed, with the exception of the Agudah, whose Jerusalem branch their community virtually became, they had not a single avowed ally anywhere in the world. Rabbi Sonmenfeld, who together with many of his contemporaries, had been denouncing Zionism on theological grounds ever since it had first come to his notice, was now compelled to defend his community's right to provide the facilities which every organized Jewish community makes available to its members; and since administrative policy and practice were usually involved in the issues under discussion, he required a loyal and well-versed lawyer to plead in the courts, advise delegates to conferences, draft petitions and memoranda, study proposals and precedents and explain the general situation in answer to sympathetic inquiries. For instance, the Zionists attempted to secure the automatic transfer of the real estate with which Jewish religious and charitable institutions had been endowed, from the Qadi’s supervision, where it had safely rested under Ottoman rule, to that of their own Rabbinate; but the publication of the text of the decree in the official gazette aroused such a storm of protest -including a cable to the Colonial Office from Rabbis Sonnenfeld and Diskin- that it was amended to exempt institutions registering within a year at the Public Trustee's office. Rabbi Moses Blau, the faithful assistant of Rabbi Sonnenfeld and his first biographer, reports that several institutions unconnected with his community took advantage of this arrangement (Amuda di-Nehora, Jerusalem 1932 p,75). Another issue on which Rabbi Sonneafeld felt strongly was that of a separate Shehitah. Here there were no legal restrictions, but hundreds of families had banned meat from their homes before the administrative pretexts that prevented the community from organizing its own meat supply in Jerusalem were set aside (ibid. p.76). The third issue arose when, after the Zionist-controlled councils had been granted the power of taxation, a tax of two piasters on every rutl (three kilos) of unleavened bread was levied. Rabbi Blau's detailed description of the resistance to it highlights the year-long court case and the plebiscite conducted by the District Commissioner among the 1.600 householders listed as members of the community. The first was lost, with defense counsel, De-Haan, paying the hundred pound fine out of his own pocket, but the second resulted in an award to the community of a share in the tax proceeds calculated on the basis of its proportion of the Jewish population-despite its objection on principle even to this indirect form of partnership. It took seven years for the government to annul the tax throughout the country (ibid. 77-79). The struggle centred round the proposed Communities Ordinance, and the community waged it from a weak legal position. 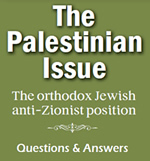 Jews seeking to opt out of the community organized for them by the Zionists could hardly appeal either to the Balfour Declaration, which guaranteed only “the civil and religious rights of the existing non-Jewish communities”, or to the text of the Mandate, whose fourth article recognized the Zionist Organization as an official agency and entrusted it with the task of advising the Government about everything connected with the realization of `the National Home'. Nevertheless, the petition drafted by De-Haan and signed on the community's behalf by Rabbis Bernstein and Jungreis began by thanking the League of Nations for its "approval of that magnificent declaration which promises to give to the suffering and wandering Jewish people- the possibility of returning and rebuilding a faithful home in the land of its two thousand years' yearning to which it has been devoted notwithstanding its compulsory separation there from for nigh twenty centuries." Moreover, this preamble was relevant to the "observations" which it heralded. They were to the effect that the reconstruction of the country was hampered by the Jewish Agency's refusal to co-opt a representative of the million orthodox Jews enrolled under the banner of the Agudah and by the denial of religious freedom to "the pioneers of the present settlement and its institutions", who "have been led to organize their community independently, being convinced that only by this course could the future preservation of the Jewish religion be assured in the country, and that by independence alone could disputes and quarrels be avoided". This petition, which was discussed during the seventh session of the League's Mandates Commission, was moderately successful: although the requests for amendments to Article 4 of the Mandate were never granted, the appeal to natural justice, religious freedom and the smooth performance of the most difficult of the Mandate's tasks eventually resulted in a modus vivendi whereby Jews in the Holy City could opt out of the general community and lead an independent communal life in accord with their consciences. But it was a long-drawn-out affair. De-Haan was actively engaged in it to his last hour, and many of the faithful have believed that he sacrificed his life for it. The Zionist press campaign against him would seem to have begun with Lord Northcliffe's visit to Jerusalem. Ruppin, who, together with three other leading Zionists, spent half-an-hour with him, noted in his diary (7.2.22) that his recent stay in India had instilled in the press magnate's mind the view that "Islam was a great power" and that Zionism was one of the many causes of British unpopularity among the Muslims. Judging from Ruppin's solitary comment that "this conversation will not have the slightest effect-either to the advantage or disadvantage of Zionism" (Pirqe Hayyay III p.31), Northcliffe was not considered a serious menace in Zionist circles. Yet when he received delegates of the independent Orthodox Community, De-Haan, who had made the arrangements, was furiously denounced as a `traitor'. This agitation provoked Rabbi Sonnenfeld to issue, for the first time, a statement to the press. After acknowledging that the delegation bad been formed on his instructions and spoken "words that need to be said", he reaffirmed his own devotion to the sacred cause of Jewish settlement in the Holy Land and the conviction of his adherents that it would be best promoted by “a just law granting complete freedom to all communities and religions”. The delegation's purpose, he continued, was to “oppose the Zionist leaderships desire to subdue the communities and administer us with the sceptre of rulers against our will and our opinions” and to join in the World Aguda's protest against the Zionist denial of its right to he represented in the Jewish Agency for Palestine; and the statement ends with a brief summary of the doctrine attributing Exile to sin and Redemption to penitence (Amuda di-Nehora pp.70-72). The identity of the delegates' pleas as expressed here in Hebrew with those subsequently formulated in English in the. petition to the League of Nations tends to support my inference that Rabbi Sonnenfeld himself decided the community's policy and strategy. So does the delegation he led in person to the Sharif Husayn. Its intent was, in accordance with tradition, appeasement of a ruling family in hope of a measure of future protection. There was an exchange of courtesies rather than views: the Rabbi recited the customary benediction on beholding human majesty, and the Sharif conferred on him membership of the Order devised for such occasions. An immediate result was the renewal of press agitation against De-Haan and his entry into Zionist mythology as `the Jewish Lawrence'. As this ridiculous comparison survives up to the time of writing, I might perhaps report that my own investigations revealed neither Arab nationalist feelings on his part nor, notwithstanding questions designed to ellicit it, a breath of scandal. Admittedly, he was then remembered among Arab acquaintances for his affable manner, lively conversation, diligent study of literary Arabic and insight into the social and political conditions of the region. Yet his repeated argument in the course of negotiations with the authorities that the grant of taxation rights to the Zionist councils would lead the Arab Executive to demand similar powers is hardly one that an Arab partisan would put forward. At that time, indeed, when he warned Colonel Kisch of the Zionist Executive (in a letter dated 16th May, 1923) that "the Arab problem becomes more and more serious every day" and that therefore "troubles amongst the Jews should be avoided" (Central Zionist Archives, file S25/583), his efforts to cultivate the friendship of Arab notables, as well as Rabbi Sonnenfeld's approval of them, were prompted by grave anxiety for the fate of Orthodox Jews, whose proximity to Arab quarters and sheer helplessness singled them out as the readiest victim of outbreaks of violence. Unfortunately, their fears were justified. Religious hatred, which, owing to our many sins, found paths in several lands abroad, had no place in this land, which is hallowed above all other lands. He who makes peace in His heights spread His tabernacle of peace over the land and city which He chose, and there was neither outbreak nor outcry in our streets. Neighbouring notables respected Jews, and Jews felt friendship and esteem for the rest of the inhabitants, and in no few cases was one section helped by the other, as is fit and proper among peaceful neighbours who together desire the success of the land where they dwell. These are the opening words of a message entitled "Words of Peace and Truth" which Rabbi Sonnenfeld composed under the shadow of the 1929 massacres. No doubt today they are liable to be dismissed as a timely expression of nostalgia on the part of an octogenarian whose experience of insecurity and oppression during the sixty of his years spent in the Old City was now mercifully obliterated by a medley of sweeter memories; but the evidence of his clarity and steadfastness to the last favours their acceptance as his assessment of the relationship between Jews and Muslims at its best or, at any rate, his appreciation of instances of kindness and consideration shown to a defenceless group at the mercy of an excitable populace. Deprived, to his sorrow, of his trusted and skilful intermediary, the Rabbi felt stirred to make a personal appeal for good-will and restraint, based on traditional aversion to quarrels with the peoples of the world as well as on traditional fear. I got a letter (in a government envelope) telling me that I shall be killed if I do not leave Palestine before the 24th. I know that the question whether it is advisable or not to kill me is seriously discussed in the circles which you have the honour to represent". De-Haan was not intimidated: he had predicted his assassination by the Zionists to the Tharaud brothers when they visited him several months before, and he appears to have cherished his dismissal from the Law College (in the wake of Zionist hooliganism at his lectures) and the pressure on the Dutch newspaper to sever its connection with him as signs that his penitence was acceptable. Yet while, on his friends' testimony, he spent his last year on earth in calm and deliberate preparation for martyrdom, he did not interrupt his work or vary his daily routine. On Monday, 30th June, 1924, he had completed his arrangements to accompany an Aguda delegation, as legal adviser, to London in order to present the community's objections to the proposed Communities Ordinance at the Colonial Office. After despatching his last message to the Daily Express (6.5 p.m.) he made his way to the synagogue in the Sha'arei Sedeq Hospital where he prayed twice daily. When the evening service was over and the worshippers had reached the hospital gates, three shots rang out. De Haan fell to the ground. His devoted friend, Dr. Wallach, the hospital's founder and director, rushed out to attend him, but his soul had already fled from his blood-stained body. "When news of the murder reached Rabbi Sonmenfeld", wrote another friend, H. A. Goodman, "he tore his clothes in mourning. De-Haan's funeral on the Mount of Olives was a demonstration of the entire religious population against this strange murder, for this was the first time in our generation that Jew stretched out his hands against Jew. Rabbi Sonnenfeld and many other Rabbis and communal leaders came to grant him the final honour, all of them outraged by the murder. During the seven days of mourning, representatives of the Arab Executive and the Muslim-Christian Association paid visits of condolence to Rabbi Sonnenfeld" (Jewish Post, 6th May 1960). Furthermore, among the eloquent eulogies published in the communal fortnightly was a (translated) tribute from Musa Kazim Pasha al-Husayni, the Mayor of Jerusalem. Expressions of shock at the crime by the Government and the Zionist Executive (who were also represented at the funeral) were matched by their concern to prevent the discovery of the criminals. The only Zionist of note to publish an unequivocal condemnation, albeit in a periodical with a restricted circulation, was Moses Beilinson, who settled in the country at about that time. The movement's flag should not be stained by the blood of either the innocent or the guilty. Otherwise, our movement will be in bad way. For blood always attracts bloodshed after it. Blood is always avenged, and if a step is taken on this path, there is no knowing where it might extend. We are strong enough to allow our enemies to remain alive and, if they use illegitimate means, to regard them with contempt; but we are not strong enough to adopt methods of war liable to involve moral destruction in the movement. Political sensitivity, concern for the purity of our movement and moral feeling compel us-irrespective of De Harm's personality or the motives of the perpetrators of this action-to issue a severe verdict on De-Haan's murder. Most Zionist editorial writers found it easier to condemn De-Haan: admittedly, the more `liberal' tended to pronounce the victim -not his murderers- insane as they sorrowfully shook their heads over the tragedy of -to descend to their jargon- a man of education and talent falling under the sway of mediaeval obscurantists. All evidently agreed that in papers read exclusively by Jews there was little point in pretending that the assassination had been instigated, planned and carried out by non-Jews. (For external consumption, the event was generally reported as "shrouded in mystery"). A change came with the hurried publication of a little book, by a party hack with the effrontery to re-name himself Ben-Yishai. The term ‘sublimation’ had obviously not yet reached the ‘enlightened’ circles of his home-town. Accordingly, be felt free to impute to De-Haan the sins which the poet's Kwatrijnen were designed to dispel even from his unguarded phantasy. This unscrupulous propaganda line, which was calculated not only to defame the murdered man but also to divert the murder-hunt to Arab quarters, met with some success in the secularist camp. Arnold Zweig relates how on 6th March 1932 he was, to his surprise, convinced that “De Haan war gar nicht von Arabern ermordet, sondern von einem juden, einem politischen Gegner, einem radikalen Zionisten, den viele Leute im Lande kennen und der noch dort lebt” (Sigmund Freud-Arnold Zweig Briefwechsel, Berlin 1968; p. 55f). The next day Zweig began dictating his unilluminating novel on the subject, “De Vriendt kehrt heim”, which was published in Berlin at the end of 1932. Among the faithful, however, no amount of Zionist propaganda could shake De-Haan's credentials. They had themselves witnessed his meticulous observance of the Divine precepts and could testify to his flawless conduct, humility, compassion and contrition. What proof could be more valid than his adherence to, and acceptance by, their spiritual leaders, his arduous endeavours in obedience to their instructions and, above all, his death at the hands of their enemies? I wish I could reproduce the tone of reverence and affection in which he was mentioned by the select hand of friends and admirers whom I was twice priveleged to accompany to his grave on 29th Sivan. And he is still commemorated-particularly by the Guardians of the City, whose frail periodical has never allowed this anniversary to pass without a hagiographical memoir. Nor has the Other Side grown indifferent to him: over the years its press agents continue to write about him from time to time, their dreary and inaccurate articles betraying ignorance of the nature of both penitence and poetry and, more generally, reinforcing De-Haan's disdain for their puny culture. Take the Haganah's eventual confession in its official history (Toledoth Ha-Haganah, Vol. 11 Part 1 1964 pp.251-3). The order allegedly came from Joseph Hecht, who instructed Zachariah Urieli, the Jerusalem commander, to have De Haan killed by the smallest possible group; and a couple of (anonymous) immigrants, too recent to have heard of De-Haan, answered Urieli's call for volunteers. From this account, the Haganah would appear to have been an autonomous force free to inflict the death penalty without the Zionist leadership's consent or even knowledge-and all on the authority of a single individual, for the writer gives us no indication of the composition of the court which passed the sentence. He is content to cite the case of Colonel Redl, an Austro-Hungarian staff officer who was blackmailed into selling military secrets to the Russians, and to assert, without a shred of evidence, that De-Haan had been similarly induced to collaborate with the Arab Executive. Analogies, however far-fetched, with the peoples of the world are, of course, part of the Zionist mystique; but the comparison with Redl is even more ludicrous than that with T. E. Lawrence, who at least shared with De-Haan an acquaintance with the Arabic language. Published verses on the Divinely-contrived conflict in the human heart scarcely expose the poet to blackmail; Zionist secrets, whether military, political or economic, were inaccessible to him; and the idea of anyone 'using' Rabbi Sonnenfeld is as conceivable as a plan for manipulating Mount Everest. De-Haan may perhaps be haunting the inward points of his enemies' souls and demanding to be exorcised by their acknowledgement of the Truth. However, the quality of Zionist propaganda is of very minor importance to us; that our heroes are their villains and vice versa lies at the root of our situation; and we ought to be more perturbed by efforts to blur the differences. Fundamentally De-Haan was murdered for publicizing these differences, for advertising to the world what the Zionists want to suppress, the fact that there are Jews who love Zion passionately and hate Zionists as defilers and despoilers of Zion. Accordingly, our homage is to be paid to the penitent who rose from the idol's feet to spit in its face and sacrificed his life to rescue the faithful from its clutches. In these uncertain times when Satan, having lavishly fullfilled his side of the bargain, is feared to be about to exact his price, the martyr's intercession is sorely needed. May the memory of his sacrifice mount to the Throne of Glory, arouse Heaven's compassion for the Remnant of Israel and hasten the Redemption of Zion, Amen. 1. The Zionist furore over Rabbi Sonnenfeld's visit to the Sharif Husayn must be understood in the light of Arab nationalism's liberal phase. Most of the anti-Zionist declarations drawn up by Arab leaders in the early twenties distinguished between Jews and Zionists; and the generosity of their sentiments induced some Oriental Jews to add their signatures to anti-Zionist petitions. In 1923, a group of them met in one of their synagogues to protest against Zionist rule and call for Jewish-Arab friendship. The Zionist leadership was shocked and alarmed by this demonstration, which it managed to keep out of the newspapers. However, the 1929 outbreak put an end to this development: their own losses forced the vast maiority of Zionism's Jewish opponents, both European and Oriental, to rely on Zionist ‘protection’. 2. Zionist newspapers have named the assassins as Abraham Krichevski (Giora) and Abraham Silberg (Tahomi)-the former is said to have died in Tel Aviv in 1942, the latter to have emigrated to California-and identified Isaac Ben-Zwi, his wife, Rachel Yanait, Moses Eisenstadt and Aviezer Yellin as prominent in the Haganah's Jerusalem branch at the time. Hecht, to whom the Haganah's historian ascribes the sole responsibility for the order to kill De-Haan, was dismissed from his command by the Zionist leadership as the result of an investigation into the Haganah's failure to give prior warning of the 1929 outbreak.